Engage water filled barriers are designed to direct and protect pedestrians, cyclists and traffic. Designed and manufactured to the highest standard, made of durable polyethylene plastic. Available in orange or white. The Engage water filled plastic barrier offers superior quality and surprising strength for a lightweight plastic jersey barrier. Polyethylene plastic provides the barrier with flexibility and prevents cracking. This multi-purpose interlocking barrier is lightweight and forms a strong delineation line once filled with water. Why choose water filled barriers over concrete? Engage water filled plastic barriers are easy to move around on site due to the lightweight nature of the plastic barriers when empty. Conversely, heavy concrete jersey barriers need a crane or large forklift to lift. Plastic water-filled barriers are an ideal substitute for short-term applications. Plastic jersey barriers also cost considerably less than concrete barriers. Plastic water filled barriers are also easy to stack and store. Fortress Fencing’s Engage water filled plastic barrier meets the highest safety standards. The Engage is a lightweight, interlocking barricade that can be used on construction sites, in car parks, at sporting events, and for general pedestrian delineation. The simple interlocking system allows for corners and bends. 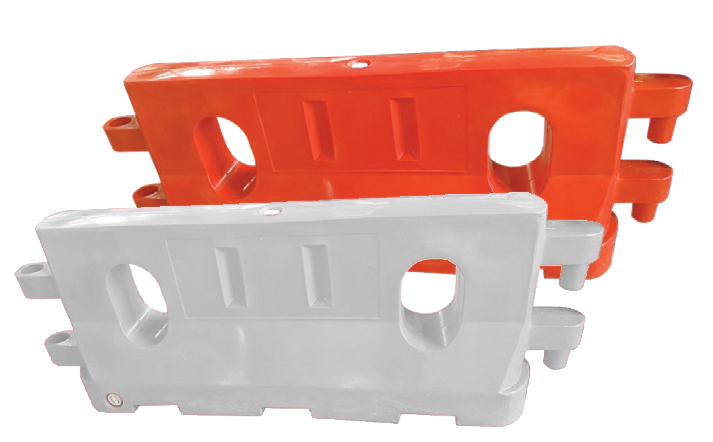 Includes forklift holes and recesses for easy movement of barriers. Highly visible orange polyethylene. Also available in white.